and obstacles, the goals and objectives, the reactions to their films so far, and the impact of an Academy Award nomination. So, to continue this series of conversations, here is Irene Taylor Brodsky, director/producer of The Final Inch, which is nominated in the Documentary Short Subject category. Synopsis: Nearly 50 years after a vaccine for polio was developed in the United States, the polio virus still finds refuge in some of the world's most vulnerable places. Into India's impoverished neighborhoods, The Final Inch follows the massive--and yet highly personalized--mission to eradicate polio from the planet. One of history's most feared diseases, now largely forgotten, polio has become a disease of the world's poor. Irene Taylor Brodsky: Still photography was my first love. In 1990, I joined a documentary film project on the Cree Nation up in Northern Quebec as a location photographer. Throughout the early '90s, I was living in Kathmandu and photographing a book on disabled people of the Himalayas. deaf children living in Nepal. IDA: What inspired you to make The Final Inch? ITB: The philanthropic division of Google was interested in promoting more awareness about polio, and often-underestimated efforts of public health workers and volunteers fighting this forgotten disease around the world. They approached me about it, and I quickly realized the epic value of the story. I have made several films about disability, and so this idea really appealed to my interests and sensibilities. from polio. Shooting in India and Afghanistan, where polio still exists, was the real challenge. Polio eradication has faced many obstacles in India, so at first the government was wary about granting us permission to film in the country. Shooting in conservative Muslim communities was tricky, and sometimes I had to take on the camera work because women were wary of allowing outside men into their homes-certainly, American men. Afghanistan was extremely dangerous, and our producer, Tom Grant, wore a bulletproof vest every day for three weeks. Despite his UN protection, the situation was volatile and it was difficult to follow storylines through to completion--especially if it meant putting our Afghani subjects in danger. ITB: We originally hoped to include a story from India, another from the US and something from Afghanistan, but because of all the shooting obstacles in Afghanistan, we decided to narrow our focus once we arrived in the editing room. Otherwise, the original vision--to shoot compelling imagery and to focus on the workers and not just the disease itself--we stuck to through the end. IDA: As you've screened The Final Inch--whether on the festival circuit, or in screening rooms, or in living rooms--how have audiences reacted to the film? What has been most surprising or unexpected about their reactions? ITB: Audiences are stunned by the sheer size of the global eradication effort. 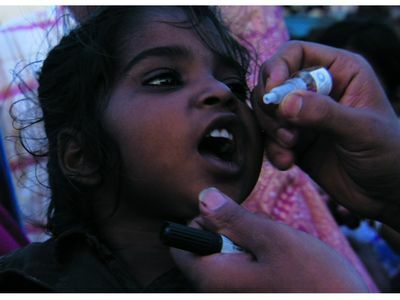 In one single day in India, for example, polio workers can vaccinate more than 150 million children. And several million people work on polio eradication in India alone. Those are astonishing numbers for a disease most of us here in the US have all but forgotten about. IDA: Where were you when you first heard about your Academy Award nomination? Although it's only been three weeks since the announcement, how do you anticipate this nomination will impact your career as a filmmaker? ITB: I was feeding my newborn baby at 5:30 a.m. when I decided to check Oscars.com. I realized the nomination sitting alone at my computer in the dark, before the sun came up on the West Coast. I think the most significant impact of this nomination right now is the awareness it will bring to the issue of polio and to the dedicated people working the frontlines of public health in the world's poorest places. Metallica portrait Some Kind of Monster. Media in New York City as part of DocuDay NY.